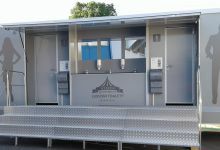 Sanitary trailer with luxury toilets 7(ladies)+2(men)+6(urinals). Equipped with handdriers, stainless washbasins. Access up the VIP stairs.